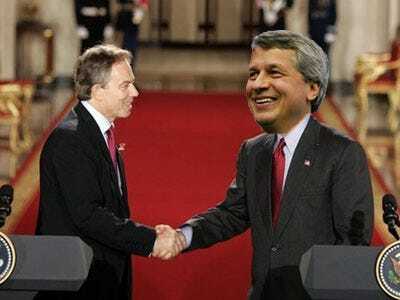 What is it about Jamie Dimon that has politicos from New York to London fawning? We’ve followed the trials and tribulations of JD’s affair with President Obama from day one, and they seem to be in a good place at the moment. But the JP Morgan chief has spread the political love around. In a new Reuters profile we learn the bank chief executive is also good buddies with two ex-national chief executives. Among his confidants are former President Bill Clinton and former British prime minister Tony Blair — two world leaders famous for their everyman approach to politics. Blair, who’s been in an advisory role to JP Morgan for three years, just loves Jamie for his forthright, no-bull nature and audacity. They even journeyed together to Africa! [O]ne thing he admires about Dimon is his straight talk and openness to honest disagreement. 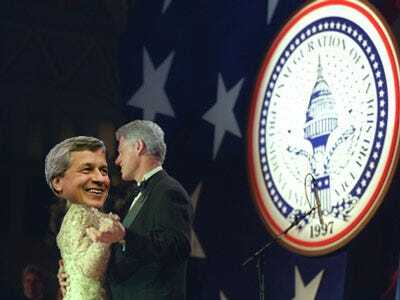 As for Bill Clinton, he can see a future for Dimon in politics. “If he decides to get out of banking, I think he would be really good in politics,” he told Reuters.